In general elections the true colours of the media really come in to focus. 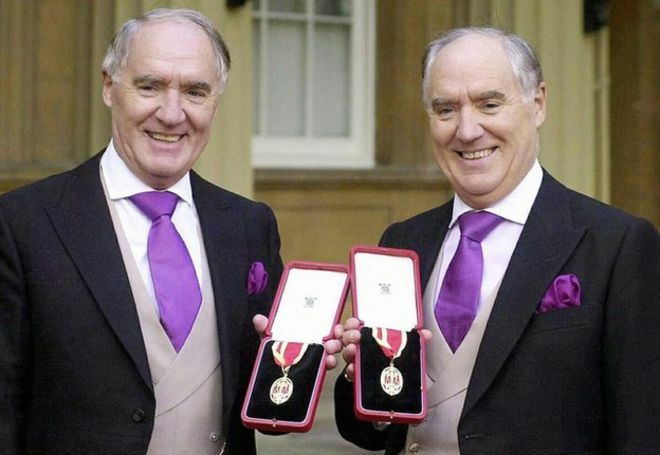 Here (right) are the Barclay brothers getting their knighthoods for services to Britain (?). They used to own the Scotsman and now they own the Telegraph. They’re often described as ‘reclusive’, which sounds endearing. If you’ve any doubt about the desperate need to protect and shelter the Prime Minister from journalists – you can listen to the interview by the BBC’s Emma Barnett at Aye Radio here – and read Ashley Douglas’s analysis of the car crash interview here. Or just watch the moment of fear this week when the Prime Minister thought a ‘journalist’ was in the room. Is that a pen in your hand or are you just pleased to see me? At least John Major and even the blessed Jim Murphy had the guts to address people on the street. If you are going to take a penny for ‘representing’ people, should you not at least have to actually meet some of them, however briefly? 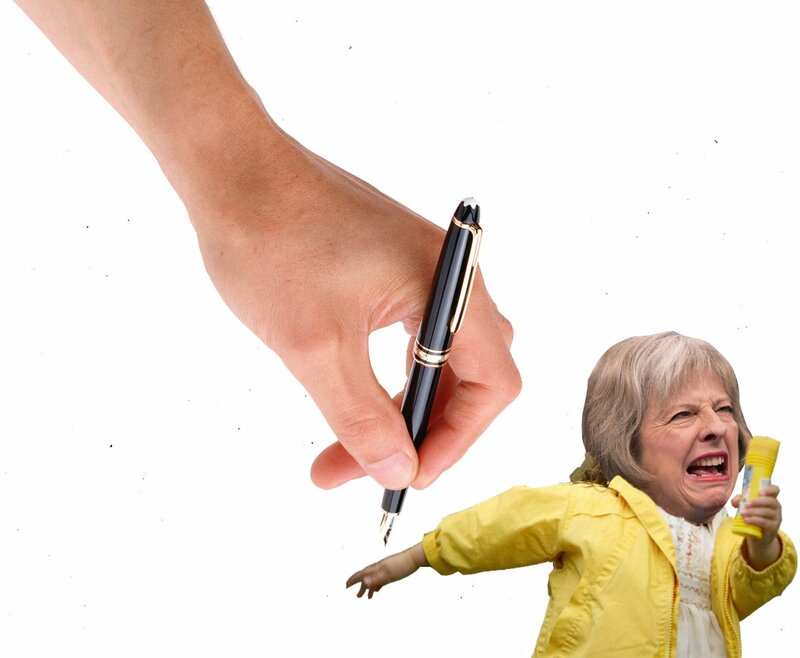 Theresa May is deeply unstable, and visibly scared of the most common interactions with ordinary people. This is desperate stuff. But it’s because there is actual choice at this election, even if that choice is remote and being thrown away by a combination of smear and incompetence. We’ve seen it before with Kinnock and Foot. Ideas that would be seen as being perfectly reasonable in most of mainland Europe (Labour’s proposed tax increases for corporations and the wealthy would put Britain in line with Germany & California), and have widespread support in the population are cast aside as being the frothing nonsense of some Marxist-throwback. If there’s one thing that comes out of this it may be a deeper media literacy in the general populace and a wider understanding of the corporate interests at play. In a week where the PM was caught clearly trying to smear the SNP by suggesting that ‘all parties’ have been reported to the Electoral Commission, a statement completely refuted by the Full fact website – it’s important not to assume that this is a bias that is aimed exclusively at the SNP. It is aimed at anyone who might affect change in Britain. The Greens, the Labour left, in fact anyone who has an articulate idea to rub together will be smeared and attacked. Watching the corporate media line-up with their political colleagues is revealing. Despite the claim that Corbn’s plans would put us ‘back to the 70s’, there is nothing particularly challenging bout anything in the Labour Manifesto. They have of course been pushed into line over Trident, with an unquestioning media failing to address some if the key logistical, moral and legal questions about our own WMD. It’s important to find the chinks of light rather than castigate the entire media. The Edinburgh audience at #BBCQT last night – which saw loud laughter at the idea that the Conservatives were ‘strong on the economy’ is the media equivalent of the boos at the back of the staged-audiences in front of Nicolae Ceaușescu. “What shocks me is reporters collaborate with May press team by agreeing to reveal their questions to them in advance”. But the press-pack are unlikely to give up access and the need to cosy-in and kow-tow is crystal clear. 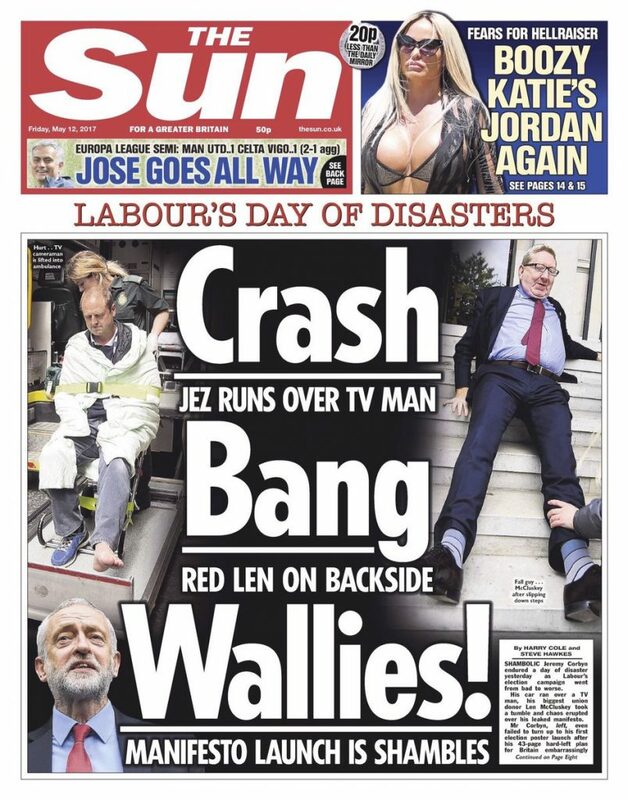 The Sun often leads the way reporting on ‘Labour’s Day of Disasters’, and the power an influence of its owner is legion. The toxic tabloid once declared ‘it was the Sun wot won it’ and it may do so again. But the idea of ‘alternative media’ as a force for change needs challenged too. The remarkable far-right Guido Fawkes (https://order-order.com) used to pose as an edgy anonymous speaker of ‘truth to power’. In one Newsnight edition the blogger Paul Staines challenged the Guardian’s Michael White from a melodramatic darkened room. Now ‘Guido’s’ site is full of links to ConHome, the Telegraph, Douglas Carswell, Iain Dale, Fraser Nelson and the Mail. As a rule of thumb anyone being smeared or attacked by the media is probably doing something quite useful. But there are great journalists out there, as it turns out, some of them even work for the BBC. Mike, you could, as easily, do a Scottish version of this article. Kevin Pringle, former SNP comms guy now writes for Murdoch’s Times. He also works as a lobbyist for Charlotte Street Partners with (for?) Andrew Wilson, former MSP and current member of SNP government Growth Commission. CSP don’t disclose their clients, but have unrivalled access to Scottish government. 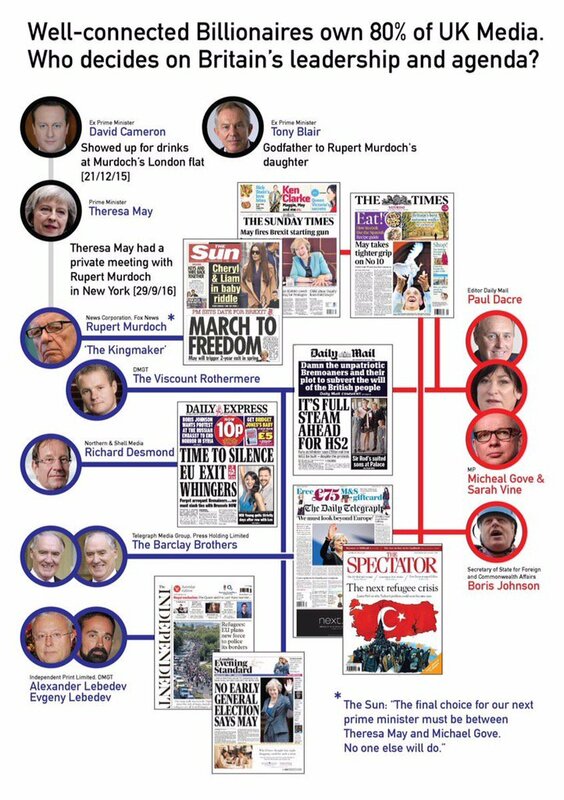 CSP recently revealed to be working for Murdoch by Peter Geoghegan at The Ferret. Alan Rosen, formerly of the Daily Mail, is now Scottish Labour’s press guy. Eric Joyce had a kick at Mr Roden on Twitter which was brilliant as Joyce dispensed with the niceties and went to town on Mr Roden. Tom Harris, former MP is the embodiment of the gilded elite who really run Scotland. He writes for the Telegraph, ran Vote Leave in Scotland, has a free pass to BBC Scotland news and current affairs, is a lobbyist with Message Matters (where he works with former SNP MSP, Marco Biagi)! Tom also works at ‘independent’ think tank Reform Scotland, where he influences Scottish public policy. Chris Deerin, formerly of the Daily Mail, former employee of CSP, is now Scottish affairs reporter for the New Statesman! So tell me, if a lobbying scandal were to erupt in Scottish politics, how would the Scottish public get to know, when the media is so compromised in terms of the inextricable links between politics, media and lobbying? Will anyone tell me how Scottish democracy is served by such a self-perpetuating old boys club? How is Scottish civic society served by a system where gilded insiders speak to gilded insiders on behalf of gilded insiders in a system where lobbying regulation is limited to face to face meetings at the suggestion of the lobbyists who were consulted on the drawing up of the legislation- the lobbying bill? I gave up on The Scotsman when Andrew Neil was made Editor.